Yesterday (or rather . . . Sunday), we spoke of two starkly different leaders; one who overcame societal odds to later lead her nation away from economic collapse, and another who also overcame societal odds to change his nation . . . but by drastically different means. One fought with ideas; the other with necklacing and bayonets. How are they both remembered today? Take a moment and do a quick internet search. It’s fairly standard, fairly benign information. A biography, Wikipedia, another biography . . . nothing to detract from the positive image we’ve all come to know. In the first 5 results, there are 3 stories with a decidedly negative slant. Nelson Mandela and his ANC violently slaughtered in the name of their cause, including innocent women and children. Margaret Thatcher fought on the battlefields of ideals. Yet given even just the simple search results we found, it wouldn’t appear that way. Nor would it judging by the actions of our president, who sent a minor delegation of former diplomats to Thatcher’s funeral, while personally attending (accompanied by significant members of his administration), and speaking at Mandela’s. While President Obama simply issued a national statement at the death of Thatcher, a staunch U.S. ally and revered protector of freedom’s principles, he ordered that our flag be flown at half-staff (a rare honor) for Nelson Mandela, a man whose reputation for violence and associations with violent, criminal Communists world-wide earned him a the moniker of terrorist. I would imagine that those South African white civilians at the receiving end of the Umkhonto we Sizwe (“Spear of the Nation”) would beg to differ. After all, it was they whom the Umkhonto (led by Mandela) vowed to kill. I can’t imagine that those listening to a newly-freed Mandela publicly singing a song about killing white farmers would agree, either. In other words, Mandela was a wrongfully imprisoned political martyr silenced in the fight to end apartheid racism in South Africa. Despite this evidence, discussions which shed light on the darker side of Mandela’s history are often combated with the notion that Mandela’s personal involvement in the heinous crimes committed by the ANC is debatable. Even if we paint Mandela with the most generous of brushes and assume that he himself did not personally carry out the terrorism, what is not debatable is his push for an approach with far greater sting . . . and he certainly did nothing to stop the crimes committed by the ANC. In fact, history seems to show us he indeed actively helped train those who would carry it out, and would continue in communication with the MK even from prison. The latter flies directly in the face of those who also try to absolve Mandela of his past by claiming that most of the violence took place while Mandela was in prison. 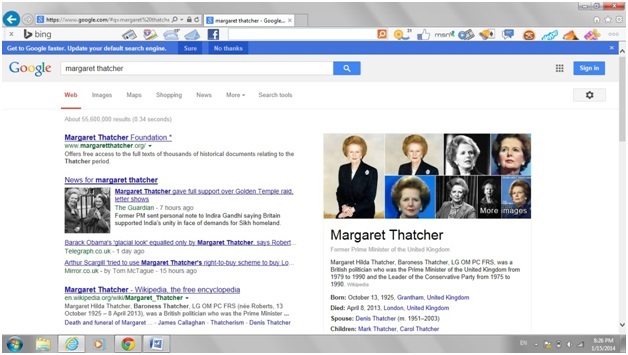 In the same breath that Mandela is revered, Thatcher and her history leadership are mocked, and even slammed as an imposter, as recently seen during Bing’s inclusion of Margaret Thatcher in a commercial run during the Golden Globes which sought to highlight heroic women. 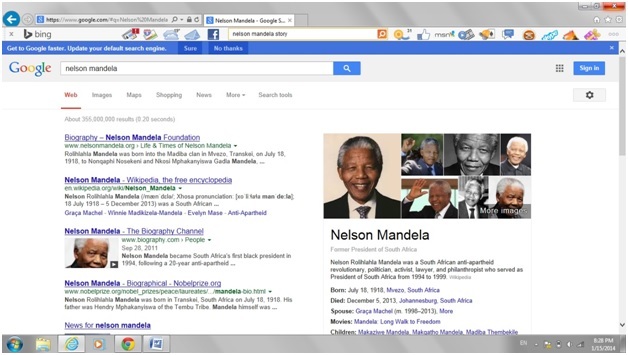 While Hollywood (and the American public) generally hailed Nelson Mandela at every opportunity during the Golden Globes, Bing was crucified by the same crowd for memorializing the Iron Lady and her achievements. This is a tale of two leaders, indeed. So–how did the two people become so differently represented? To begin with, we live in a world of sensationalized media and hyper political correctness. Quite frankly, elevating one of these two individuals makes for a more exciting story, and more importantly, pays homage to a political correctness we’ve foisted on ourselves in an effort to erase the racial sins of our past. In other words– many today are willing to go to extremes in order to elevate someone from the race that was once so persecuted in our country, even if it means hiding the less attractive facets of that person’s life. Nelson Mandela’s (at least, the squeaky-clean version) is a story that does just that– it emphasizing the punishing of white racists, and lifts up an African man to international prominence. It embodies, or at least appears to, the same fervor and excitement with which people voted for Barack Obama in this country . . . that is, it embodies the idea that Martin Luther King Jr.’s message of equality indeed did come to fruition. Men whose race would have previously condemned them to obscurity have been able to take on the world stage, and that’s a story everyone wants to tell. A tainted personal history would taint the influence of Mandela’s story, and would taint the effort to hold him up as the example to follow. What if George Washington was remembered as a treacherous war criminal and Adolf Hitler as a heroic man who rid his nation of “undesirables” for the good of his people and his nation? And, it’s up to all of us to ensure that it is remembered exactly as it happened. There’s a common phrase often thrown around by marketing teams and sales people: “Don’t just take our word for it . . .“which they then follow up with proof points and evidence to back their claims up. How often do we get real, true-blue proof points out of those from whom we get our news, or our history? Question claims to greatness. True greatness is a rarity in this world, and its counterfeits are far greater than the real deal. Ask these questions: Why is ____ great? What makes _____ great? How did _____ come to greatness? Unlike dictatorships like China, North Korea, et al, we have a relatively open internet, and thus relatively unchained access to just about any piece of information imaginable. Use it. Don’t just take their word for it– whether “they” be entertainers, news broadcasters, columnists, professors, etc. We are a free people– don’t be boxed in by an unwillingness to cross-check the constant stream of information thrown our way daily. We are blessedly free to validate the information we receive. This is so important, for indeed, ignorance is bliss– but its consequences certainly are not. A very good article! I really like how in the last paragraph you admonish people to use their free access to information to research what is truth and what are lies, and to question what “they” say (the media, etc.). I must say I had not known about all of the violence that Mandela took part in and encouraged. The media just painted him as a freedom fighter in the most gentle sense – a soft-spoken older statesman. Thanks for the truth!! !